When India overtook China as the fastest growing major economy in the world earlier this year, the significance of the development did not go unnoticed. With this breakthrough, India had stormed the global scene to claim its rightful place among the world’s top economies. Its GDP had grown to 7.6% from 7.2% a year ago, consolidating its position as one of the few bright spots in a flailing global economy. The development gave cause for hope to the Narendra Modi government, which had introduced during the preceding two years several concrete measures to boost the economic growth of the country. Rating agencies such as Crisil have predicted a further growth in India’s GDP to 7.9% in 2016-17. The prediction is backed by good rainfall during the monsoon and an upward yield in agricultural production this year. 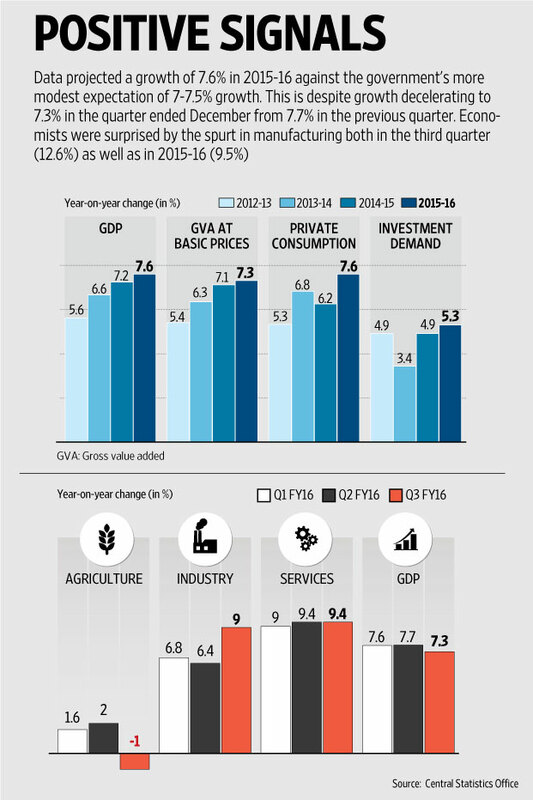 Crisil has noted another positive development – sustainability of nominal GDP growth. Domestic credit growth has averaged 9.8% in the last two years, almost in lockstep with 10.2% nominal GDP growth. India had, in fact, been found firmly latched onto the graph of growth for quite some time, as a nation with a young workforce, a large English-speaking population, a stable government at the centre, rising forex reserves and related indicators conducive to the upsurge in capital investments. The investment growth had, however, become sluggish on account of daunting impediments such as the absence of bureaucratic reforms or a major breakthrough in the infrastructure development. The situation had been compounded by corruption, inflationary trends of the market, etc. When the new government at the centre blazed its way through in 2014 and dedicated itself to an inclusive growth backed by investment-friendly policies and schemes, the corporate houses at home as also their foreign competitors became witnesses to a new era of development – a period marked by structural reforms, the slashing of the mire of legislative bottlenecks and rejuvenation of a comatic bureaucracy that had ridden piggyback in the previous years on successive lacklustre governments that lacked the will to spur economic growth. Observers of global financial and economic trends observed that India’s macroeconomic prospects had improved. This became possible on account of the relaxation of rules governing foreign investment in more than a dozen sectors including insurance, pensions and railways; cutting of red tape and pushing through of legislative proposals in a bid to simplify bankruptcy procedures and strengthen intellectual property rights. The Union government had also fast-tracked infrastructure development. Road-building as well as railway and highways expansion have also been accelerated. Notwithstanding the global buzz around India on account of the impressive performance of its economy, the nation finds it difficult to further the pace of its economic growth. This is owing to the inhibiting factors in an unsupportive global environment and stagnant investment in some sections of the private sector. According to many analysts, India stands poised to take over Japan’s place as the third largest economy in the world by 2020 from its current standing of tenth. Some analysts believe that India may grow even faster than that and beat the US to the second place. 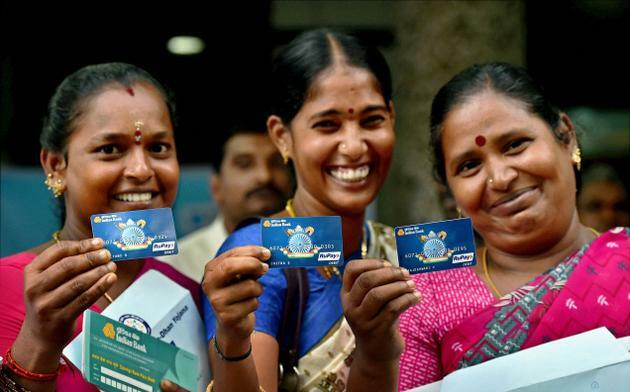 They cite India’s young and faster-growing population as the key factors that will contribute to this renewed rate of its economic growth. Does this mean that India will become a developed country when it joins the august ranks of the top economies of the world, which at the current pace of developments is expected to happen by 2020, give or take a year? Unfortunately, the answer is in the negative. What makes a country truly eligible to be termed a developed nation is not an impressive economy alone. It covers a wide spectrum of human development indices in areas ranging from freedom from hunger, poverty and unemployment, social welfare, education, healthcare, gender equality, child mortality, freedom from religious oppression, etc. High forex reserves and business-friendly environment help but are not directly proportional to sound human development indices in crucial areas such as the ones mentioned above. India government has already launched ambitious plans like the Jan Dhan Yojana, Beti Bachao Beti Padao, Swachh Bharat, rejuvenation of Ganga and other water bodies, Uniform Civil Code, unearthing of black money, etc, to lift the people from the abyss of poverty and raise their living conditions and standards that would entail robust human development indices. Implementation of these plans, programs and policies will not be easy or hassle-free. It calls for the strongest of political will, sagacity, egalitarian outlook, fortitude, vision, successful foreign policy and personal integrity on the part of the leaders in power and understanding, forbearance and unstinting support and cooperation on the part of the people of the country for the government’s programs. In this hour of the nation’s fight against terrorism and its global fountainhead, namely, Pakistan, the people of the country stand united in a show of political maturity and unstinting love for the country. Following the recent successful surgical strikes conducted by the Indian Army against the launch pads of terrorists across the India-Pakistan Line of Control (LoC), there has been a tremendous upsurge of patriotism among the people, cutting across their diverse political, religious and communal orientations. We hear about the boycott of products from China, the all-weather friend of Pakistan, by the Indian consumer fired with nationalist feelings and selfless love for the country. There are, however, some political parties and sections of the media, which harbour fissiparous tendencies and lend their voice in support to the anti-national elements that are bent on thwarting the nation’s fight against terrorism. Their modus operandi is to discredit the Armed Forces and the establishment. This is unfortunate and untenable. We can’t afford a full-fledged war that may put our nation behind in its march to development by several decades. To avoid such a terrifying possibility, it is important that our Armed forces get all the support from the people in carrying out their overt and covert anti-terrorist operations with aplomb. Unity and political stability, especially in terrorism-hit areas like the Kashmir valley, are the need of the hour. Following the recent dastardly attack by Pak-trained terrorists on the Indian Army camp at Uri, India has exercised remarkable strategic restraint. Unlike Pakistan, it has amply demonstrated its political maturity by refraining from jingoism and empty talks of its nuclear capability. At the same time, India has asserted its right to defend its territorial integrity by all means including pre-emptive military strikes. India has also been successful in unmasking Pakistan as a terrorist state in the international arena. Pakistan has been isolated by means of India’s diplomatic forays in diverse fora such as the UNGA and SAARC. Reports on the revisiting of the Indus Water Treaty as well as the MFN status in bilateral trade by India have proved much too hard for that country to ignore while carrying on its usage of terrorism as a state policy towards India. Our country’s repeated warnings to Pakistan that the ceasefire violations by the Pak forces across the LoC will be returned in equal measure and kind has also sent that country into a tizzy. The discrediting of Pakistan in the international arena for using terrorism against India as well as its own people in Balochistan, speaks volumes of the success of Prime Minister Modi’s astute political leadership and foreign policy and the coming of age of the nation’s defence capability. These are all milestones in the Modi government’s roadmap to the goal of the status of a developed nation. Modernization and upgrading of the Armed forces and indigenization and self-sufficiency of the weapons system are among the government’s priority areas. That India is steadily on its way to becoming a developed nation is an established fact. Given the tremendous strides it has already made in highly specialized areas like space science and information technology, its enormous soft power (culture, spirituality, religious tolerance, etc), and self-sufficiency in food, India can definitely hope to become entitled to the much-coveted sobriquet of a Developed Nation in a couple of decades, if not earlier. Unless the country is rid of regional politics, we can never develop. Political parties fight with one another and do not concentrate on their core duties of growth and upliftment. In the interest of all, BJP should leave talking about hindutva and cows. Poor are not concerned about about meat or religion, they only want freedom from poverty. Numbers look very positive and all eminent organisations have said that India is the brighest spot in world. Get going the same way. I am particularly worried about people who say that our data is contradictory. They must know that compilaing data is such a perilous job and omissions are bound to happen. Even US and China make these errors. People role is the bedrock of any democracy and its economy. To improve economic scenario, private investment and risk taking should come as early as possible. Kashmir issue will be sorted out if Modi remains PM till 2024. Pakistan has been isolated and they will now feel the pinch of being supporter of terrorist organizations. Russia and USA are in Indias favour then why worry about China or Pakistan. Even Middle East countries talk about friendship with us. When digitisation will reach its peak and all government services will become online, corruption will end and we will see a dawn of reformed and developed country. In the last 2 years, central government has launched many schemes which however have not reached the mass. They must popularise programs like Skill India and mygov.in portal. All should know that by being modern we cannot say that we have also become developed. India cannot forego its cultural values for want of consumerism. Mindset of people must change. Developed Nation does not mean only growth In GDP. Distribution of wealth/ prosperity is important to offer quality of life for all. Education and economic livelihood are prerequisite.